Anti – Communist Hall, Ringsend (1930s) | Come Here To Me! Anyone have anymore information on the Anti – Communist Hall that was based in Thorncastle Street, Ringsend in the mid 1930s? (George) when he was a young man … joined the anti-Communist group, which was the hub of social life at the time. It was on Thorncastle Street in Ringsend, opposite the old school, also known as the stables. It was run by another local man, Mr. Dolan. You could play pool there, and on Saturday nights, if you had 3d in your pocket, you could attend the weekly dance. They had a professional pianist and sometimes when he didn’t turn up, George would step in and play for the night. He was paid five shillings, a lot of money in those days. 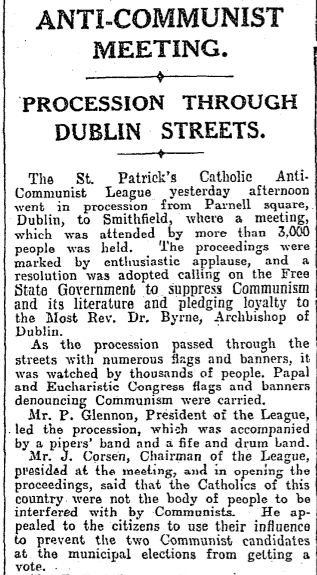 I assume that it was a local branch headquarters of the St Patrick’s Anti-Communist League that was active in the period. Does anyone know of any other similar halls?